The Leonora Ensemble is made up of some of the finest professional musicians in Sydney. The basis of the the Leonora Ensemble is a string quartet with two violins, viola and cello. However this can be tailored to a smaller or larger group, with the option of flute if desired. The ensemble has performed at numerous corporate and community functions including a performance for a Sydney Festival 'Music on Site' series at the Great Synagogue. It also plays at many private functions in the form of weddings, barmitzvahs and at university graduation ceremonies. The Ensemble's members have all played in the major professional orchestras of Sydney. A wide repertoire of music is available ranging form light classics, to film scores, continental and more. 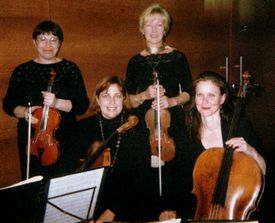 In addition to it's excellent quality of music, the Leonora Ensemble is a conscientious and professional group.